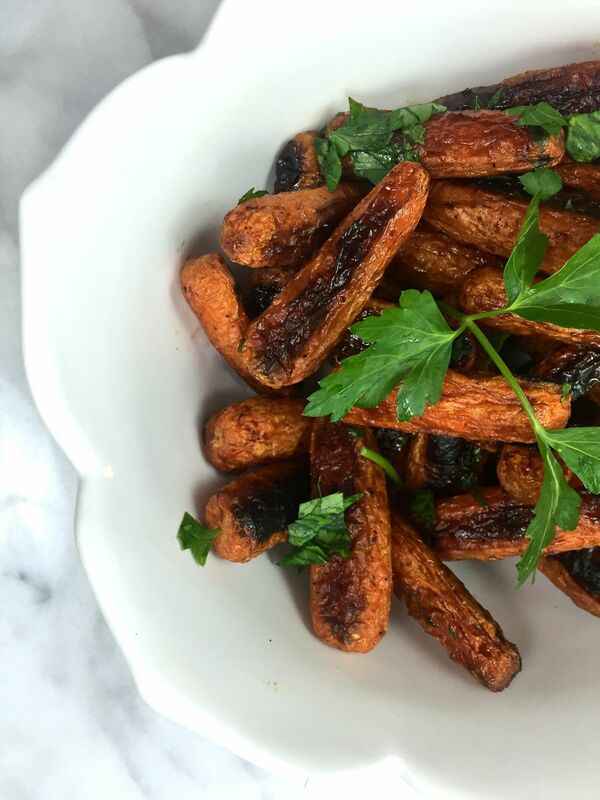 If you’ve got a sad and lonely bag of baby carrots sitting in your fridge, pull them out and make this roasted carrot dish now! You will be pleasantly surprised if you’ve never roasted carrots before. Roasting concentrates their natural sugars and flavor and they’re very different from raw or steamed carrots. I often just eat baby carrots raw, but it turns out they are not just a healthy snack. They are also a healthy side dish! This recipe calls for pomegranate molasses, which is a wonderful ingredient to have on hand if you like to make Middle Eastern dishes. It is basically pomegranate juice that has been reduced way down so it’s thick and sticky, and you can even make your own (but I bought mine). But if you don’t have any, the original recipe from Food52 says you can use balsamic vinegar, which is a bit more likely to be in your kitchen already. Just don’t use regular molasses – it’s too strong for this dish. As I mentioned above, this recipe is adapted from Food52 – one of my favorite online resources for recipes. The creators of Food52 are also behind the fabulous New York Times Cookbook: Classic Recipes for a New Century from 2011 and the recently published Food52 Genius Recipes: 100 Recipes That Will Change the Way You Cook. If you love cookbooks like I do, I highly recommend both books. Tons of recipes, food lore, food science, and social history to enjoy! Ready to roast some carrots now? Equipment: Rimmed baking sheet, aluminum foil. Preheat oven to 425 F. Line your baking sheet with aluminum foil. Toss carrots with olive oil, salt, and freshly ground pepper to taste. Spread in a single layer on baking sheet. Roast for 15 minutes, stir well, and roast for 10 more minutes. They should be getting nice and brown. Remove from oven and drizzle with pomegranate molasses or balsamic vinegar; toss gently to coat the carrots. Roast for about 5 minutes more, or until carrots are golden, sticky and soft. Serve garnished with chopped fresh herbs. Enjoy! Liked this post? Subscribe by email (up top) for more easy, healthy vegetarian and seafood recipes! This is a radish*rose recipe adapted from the source(s) named above. All images & content are copyright protected. All rights reserved. Please do not use my images without prior permission. If you want to republish a recipe, please credit radish*rose and link back to the recipe.